The Logitech Ultrathin Keyboard Cover for iPad mini is a super slim Bluetooth keyboard and aluminum smart cover for the iPad mini. 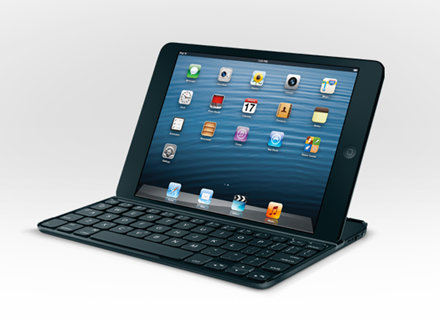 Logitech describes it as ‘the other half of your iPad mini’. I did a review last year of its big brother – the Logitech Keyboard Cover for iPad. I was disappointed in that one primarily because the cover would come unattached from the iPad far too easily. I also thought the keyboard was not overly impressive. My understanding is that the flaw in attaching strongly was corrected quickly – as many users who bought one in months after I did reported no problems with that issue. 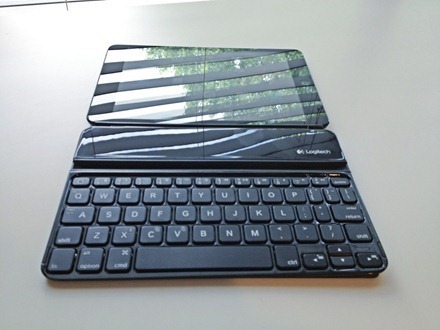 The Logitech Ultrathin Keyboard Cover for iPad mini (which I’m just going to call the Logitech Ultrathin for iPad mini brevity sake from here on) looked very good when I first saw it announced and I ordered one fairy soon afterwards. I’ve had mine for about a month now – and I’m ready to share my thoughts on it. 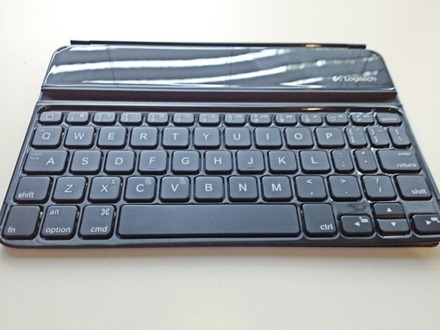 One of the more notable features for this keyboard cover include its lightweight form factor – it weighs in at just 208g – almost a third less than the iPad mini itself. Featuring EasyType keys for fast and comfortable typing experience. EasyType keys offer a traditional typing layout in a small form factor, plus iPad mini function shortcut keys for commands you use most often, such as copy, paste and more. The keyboard case comes in three colors: black, white, and purple. I got the black model. — The cover is very nice looking, and the black model that I’ve got matches perfectly with the slate back of the iPad mini. In fact this cover and the iPad mini are a more natural looking pair than the iPad mini and any of Apple’s own Smart Covers. It’s definitely a handsome and professional looking companion for the iPad mini. 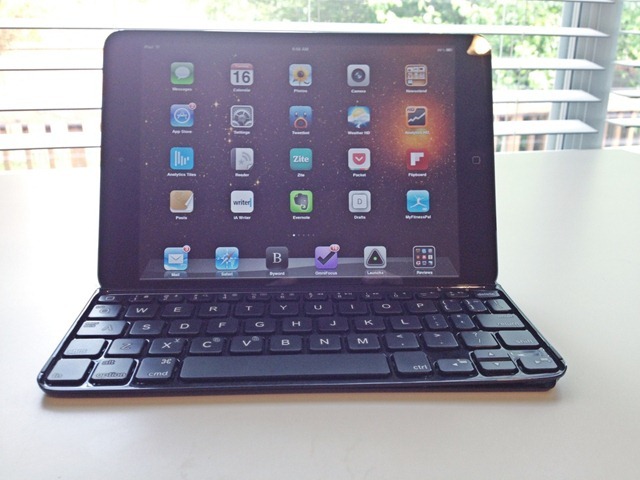 — The keyboard is considerably better than I expected it to be, given that it’s sized down for the iPad mini. 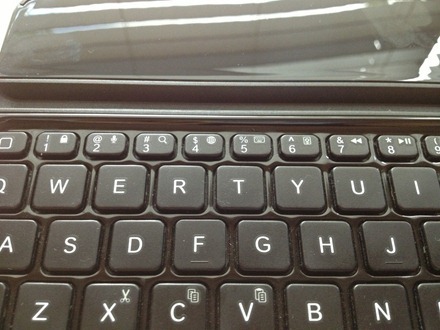 The key spacing on the main four rows of the keyboard is pretty generous and the keys feel good when you strike them. After a little while practicing I feel pretty effective using it. I’m not going to say it’s as good as a full size Bluetooth keyboard, or even one that’s sized for the standard iPad – because it is physically smaller and just can’t be. But I’d say it works very well given its smaller size. I’ve found I can happily take review notes and write shorter posts on it. — It supports the iPad’s automatic sleep/wake feature, and of course attaches very easily via magnets to the left side of the iPad mini. It also does stay attached well to the iPad mini, far better than the Logitech Ultrathin Keyboard Cover for iPad did for me. When testing, I can’t go crazy and swing the iPad mini around while it’s in the keyboard cover, but I can hold it up by gently by the cover without it falling out. More importantly, it stays nicely in place when it’s in real use in my home office and when using it when I’m working with outside the office. 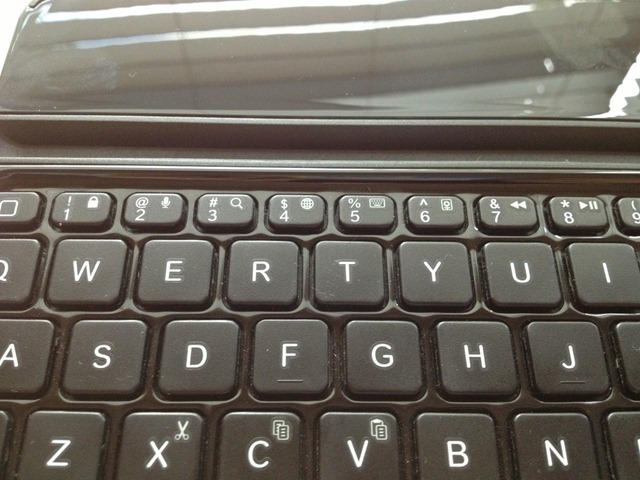 — The iPad mini slots into the groove in the keyboard. The groove is also magnetized and holds the iPad mini in place very securely at a good typing and viewing angle. — The Bluetooth pairing with the iPad mini is quick and easy to setup and works flawlessly. — The keyboard includes the standard set of function keys for returning to the home screen, pulling up Spotlight Search, music controls etc. It also has some handy arrow keys at the bottom right – used to move the cursor left, right, up, and down. Hitting the fn key and the spacebar toggles the Multitasking Bar visible and hidden. — The top row of number keys is significantly smaller than the rest and positioned quite close to where the iPad mini is held. This makes them considerably harder to use without mistakes – and I find that my fingers end up hitting the iPad mini’s touch screen fairly often when using these keys – which usually causes the cursor to jump to somewhere I don’t want it to be. — It comes with a ridiculously short charge cable (about 1.5 foot I’d guess). I discarded it straight away and used another longer cable I had around. I was hoping the Logitech Ultrathin Keyboard Cover for iPad mini would be more impressive than its big brother and it definitely is. It’s got a mostly very capable keyboard, is great looking, and serves as a very nice companion if you feel the need for an external keyboard. It’s easy and lightweight to carry around, and a very good option if you’re looking for a keyboard cover for the iPad mini. You can see more details and place an order at the Logitech product page for the Logitech Ultrathin Keyboard Cover for iPad mini. Disclosure: This iPad accessory was independently purchased by the post author. For information about our review policies please see our About page. I bought. Its a very nifty keyboard. Lightweight, compact. Good keyboard for the size. I had a Kensington for my original iPad. The shift key was in the wrong place and it drove me crazy! I never used it. This one connects seamlessly thru Bluetooth, immediately. i just bought this based on your review. Beautifully designed. Great key clicks. I think I’m gonna need smaller hands though. I know what you mean, but my fingers have got more used to it the more time I’ve spent with it. How do you tell the iPad2 to print from the Logitech keyboard? I got this, too. It’s great I had no idea how much I was suffering before! 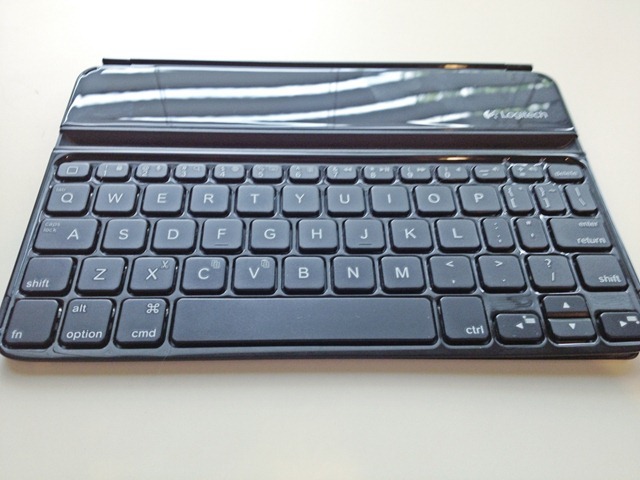 I saw another review where they just used this keyboard over their Smart Cover (the hinge fits), then used the Smart Cover to stand up the iPad behind the keyboard. It’s really nice this way because then your hands don’t accidentally touch the screen with ithe iPad further back.